Ah Puch is closely attuned with the dead and may exhume decaying corpses at his will. When walking over a decaying corpse, Ah Puch lowers the Cooldown of Undead Surge by 2s, restores 6% of his maximum Health and 3% of his maximum Mana. Decaying corpses last 45s. A maximum of 6 corpses can be out at any one time. Ah Puch raises up to two decaying corpses from the underworld that surge forward exploding on anything they touch, when they reach maximum distance, or when Ah Puch reactivates Undead Surge dealing 90/110/130/150/170 (+35% of your Magical Power) damage and Slowing targets hit by 40% for 3s. The corpses collapse after exploding remaining behind. Cooldown: 10s. Cost: 70/80/90/100/110. Ah Puch causes the target area to explode dealing 60/70/80/90/100 (+10% of your Magical Power) damage. Corpse Explosion also causes any decaying corpses in the area to explode dealing 60/85/110/135/160 (+25% of your Magical Power) damage. Cooldown: 8s. Cost: 60/70/80/90/100. Ah Puch throws a charm from the underworld which awakens a decaying corpse that applies miasma to targets in an area and falls to the ground, remaining behind. Targets take 32/34/36/38/40 (+15% of your Magical Power) damage every second. After the duration, targets take an additional 20/30/40/50/60 (+10% of your Magical Power) damage and are Stunned for 1s plus +0.5s for each time they were healed by an ability during the initial duration. Cooldown: 10s. Cost: 70. Ah Puch unleashes an army of wraiths from the Ninth Hell that swarm forward and deal 40/50/60/70/80 (+10% of your Magical Power) damage to enemies they collide with and apply a 7% stacking Slow for 2s (maximum 8 stacks). Cooldown: 90s. Cost: 100/110/120/130/140. 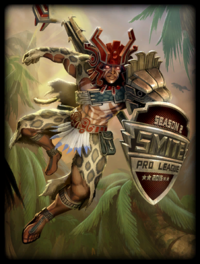 View the Developer Insight to learn more about Ah Puch's design and development process. A new “Achievement Score” has been added to the Player Profile. You can now pick and save your favorite Achievements to show on your Player Profile. Unlock the new Season Ticket bundle and receive two SPL Xbalanque skins, the Season Ticket Loading Frame, and access to the Season Ticket Fantasy Game! Every ticket purchased contributes $2.50 to the general prize pool for Season 2 eSports. Each week you make picks for which teams you think will win Smite Pro League match-ups. Picking correctly will earn +20 Fantasy Points. 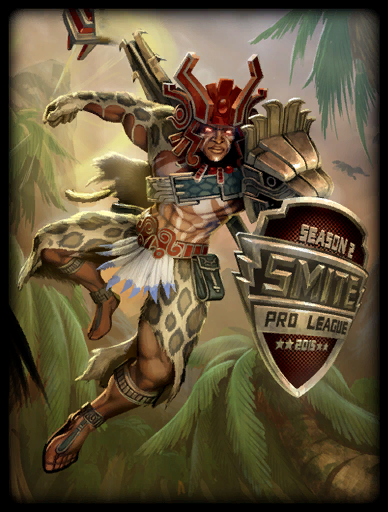 Players can also earn +15 Fantasy Points for winning any Normal or League SMITE match while using the Season Ticket Loading Frame. Earning Fantasy Points unlocks additional Limited rewards like the Executioner Nemesis Skin, and the Void Wyrm Kukulkan Skin! The Summer Split of the Pro League starts May 14, 2015 and features 7 weeks of play and 16 games per week. The Season Ticket will also cover the third and final Split of the Season, leading up to the World Championship. The Season Ticket Loading Frame shows how many Fantasy Points you have earned, and also promotes the date and time of the next Smite Pro League match-up. NEW SMITE Store! The SMITE store has been completely overhauled. You can now easily search for skins, wards, emotes, and all other content in one convenient location. Added blur effect behind UI panels when Shader Detail is set to High and above. Added option to disable/enable sound notifications in Audio settings. Music Volume slider now controls the Landing Page music. NOTE: If your music is off you won't hear the awesome new Kawaii skin song! Updated messages when unable to use clan name. Updated more tooltips for inconsistencies. Fixed tooltips remaining on screen if you drag and release outside of the items. Fixed typo in ‘Earning Honor’ description. Fixed typo in Siege & Wild Juggernaut Kill Accolade description. Fixed typo in Revenge Accolade description. Fixed being able to edit the ‘Send’ button in chat. Fixed ‘Hide God Stats’ option persisting in Profile Loadouts. Fixed ‘Friends Online’ notifications showing incorrect values when clan members were online. Fixed the enemy god slots not showing properly aligned in the match lobby. Fixed Attack Speed cap showing as 2 in the Character Builder. Added some new contextual lines to the Arena and Conquest Tutorials. Fixed Order side Brute Minion in Arena not deducting points while under 10 tickets. Fixed being able to leash Arena buff camps far out of range. Fixed issue with Old Phoenixes sometimes spawning off center of their pedestals. Fixed issue in Profile/History where searching for another player would briefly display incorrect data. Improved players experiencing hitching/jitter when interacting with deployable walls. Fixed buff camps in Conquest sometimes spawning into collision. Fixed names over wards still showing player names when choosing Gods names. Enhanced integration with Curse Voice. Now you can see which friends have Curse Voice installed and if it is running. You can direct call using Curse Voice from your Friends List. An additional Clan quest has been added. Fixed sorting issue in League with Friends List. Fixed Shutdown Accolade not working. The SWC lobby pedestal fx will now only appear while the pedestal is loading. Fixed an issue that caused some Gods/Skins to play incorrect voice lines. Fixed Cudgel showing in the item store to all Gods. 20 Magical Power, 100 Mana, 800 Gold. Passive - Hitting an enemy with a Basic Attack tears out and stores a portion of their soul. Each soul grants +4 MP5. At 5 souls, your next ability cast is at +30 Magical Power. Health reduced from 150 to 100. Reduced base Physical Power from +30 to +25. Increased maximum stacks from 60 to 75. Reduced Physical Lifesteal per stack from 0.25% to 0.20%. Reduced Physical Power per stack from 0.5 to 0.4. Health increased from 300 to 400. Reduced price from 1950g to 1790g. Increased Physical Power from +25 to +30. Health reduced from 200 to 100. Slow reduced from 25% to 15%. Fixed buff using incorrect icon. Increased cooldown from 45s to 60s. Health increased from 100 to 150. Passive Changed: You gain +14% additional Movement Speed and +25 HP5 while out of combat. Each time you hit an enemy god with an ability you earn +50 Experience and +30 Gold. This cannot occur on the same god more than once every 90s. Now automatically detonates at the end of its duration if Ao Kuang did not manually detonate. This ability can now be activated in Stealth without revealing Ao Kuang. Increased cast range from 15 ft to 17 ft. Increased kill threshold form 23/26/29/32/35 to 30% at all ranks. Now restores 10/15/20/25/30% of Ao Kuang's maximum Health upon successful execution. Increased base Physical Power from 36 to 40. Increased base Physical Power per level from 2.5 to 2.6. Fixed Liberté skin playing Standard Athena voice when casting ability. Tyr knock ups are now pullable by Awilix. Fixed missing Physical indicator on god icon. Fixed Lotus Crown Passive not working when Section 1 is activated. Fixed the description saying “Magical Power”. Fixed Denton showing off to the right on He Bro and Sydney Shredder during Defeat. Now also applies a 30/35/40/45/50% Attack Speed slow if enemies are awoken early. Adjusted the targeter shown after casting ability to be more accurate. 25% of the damage from this ability now happens on the initial hit, with the remaining 75% upon landing. Initial hit now deals 75/100/125/150/175 damage (15% of your Magical Power). Landing hit now deals 225/300/375/450/525 damage (+40% of your Magical Power). Fixed Mercury gaining full bonus on his Passive from Talaria Boots, even while in combat. Fixed an incorrect scaling issue on secondary targets hit. Increased base damage from 80/140/200/260/320 to 90/155/220/285/350. Increased scaling from 80% to 90%. Increased base Attack Speed from 0.95 to 1. Fixed showing 2x Boots in the recommended list. Increased bonus Minion and Jungle camp damage from +20% to +25%. Increased damage from 80/130/180/230/280 to 90/140/190/240/290. Increased Tiger Stun duration from 0.6/0.8/1.0/1.2/1.4 to 1.0/1.1/1.2/1.3/1.4. Fixed Denton showing off to the right during Defeat. Fixed missing glow effect on the Shinobalanque skin. This page was last edited on 1 May 2015, at 10:37.